The NYC-based Type Directors Club will hold a one-day conference with the theme 'Type: More _ than Ever' to celebrate the importance of type and typography in global culture. The keynote speaker for the event will be Fiona Ross, who is also a TDC Medal recipient. 'Facing the World: Towards a Global History of Non-Latin Type Design' is a special issue of Philological Encounters, edited by Thomas S. Mullaney of Stanford University, and published by Brill. The inaugural symposium of the Creative Chinese Character Industry took place at the Beijing Convention Center on 3 and 4 November. The symposium brought together speakers from different areas of research and professional practice relating to the Chinese script: linguistics, Sinology, typeface design, publishing, and calligraphy. The symposium concluded with the preparatory work for the founding of the Chinese Character League, an interdisciplinary body bringing together organisations and agencies, including the Chinese Character Museum in Anyang. 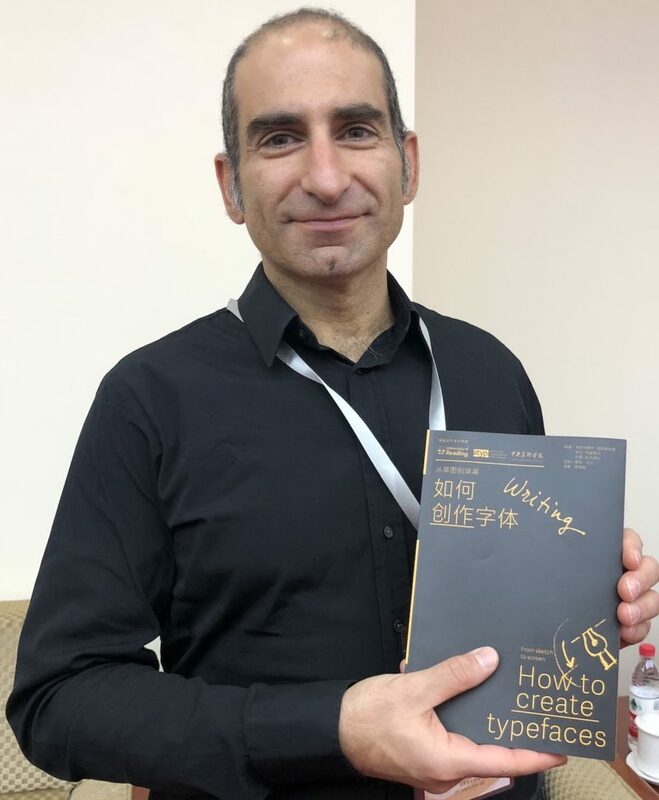 In addition to speaking at the Symposium and being invited to act as guide for the CCL, Gerry Leonidas had the opportunity to update plans for a project, supported by the University of Reading and ATypI, of publishing key typography texts in Chinese. The first title in the series, Jan Middendorp’s Shaping Text, is nearly out of print already; below, Gerry holds the proof edition of the second title, How to create typefaces by Cristobal Henestrosa, Laura Meseguer, and José Scaglione. The series extends to twelve titles, with a schedule of publishing two titles per year.